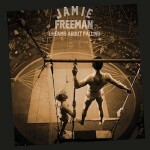 Share the post "Album review: JAMIE FREEMAN – Dreams About Falling"
Jamie Freeman (brother of the BAFTA and Emmy award-winning Martin Freeman aka Dr Watson!) returns with his third album, which was produced by Grammy-nominated Neilson Hubbard in Nashville. ‘All In The Name’ has already been released as a lead track and with its strong pop theme it is one of the album’s many highlights. ‘Down Range’ features a duet with Angaleena Presley, a heartfelt tale of a Gulf War veteran returning to his wife and adjusting back to everyday life. The other duet on here. ‘The Man I Want To Be’, features Amy Speace on a tale about how we often want to be someone better than we are. Jamie Freeman and Ben Glover have written a moving song based on the Grenfell fire called ‘The Fire’, a song that has both a memorable melody and lyric. ‘Darker Wave’ is a curveball with distorted guitar parts, part Pixies and part 60’s psychedelia. There are plenty of musical highlights throughout including the pedal steel guitar on ‘Match Amongst The Ashes’ and the jaunty beat on ‘Rum And Smoke’ (the song is about an alcoholic father). This entry was posted in ALBUM REVIEWS, ALBUM REVIEWS (Mobile), All Posts and tagged album, Americana, Angaleena Presley, country, Dreams About Falling, Jamie Freeman, pop, review, singer songwriter. Bookmark the permalink.